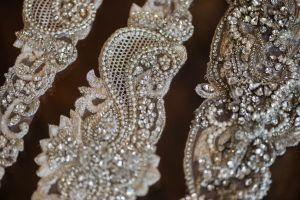 Alterations are offered as a courtesy service at Jennifer's on a first booked first serve basis. We do not contact you to schedule, it is your responsibility to book your fittings. Fitting appointments are made directly with our seamstresses. Alterations are an additional charge based on what you have done, there is not a flat fee. An estimate is provided at your first fitting and payable at your second fitting. Alterations on average run $300-$500. Your gown will then be steamed, pressed and placed on a bust form for pick up for $55. Fittings are suggested to be booked at least 4 months before your wedding date and typically begin 10-12 weeks before your wedding. Alterations needing to be completed in less than 4 weeks are subject to a $100 rush fee. Samples purchased off the rack are charged a $25 refreshing fee which covers replacing missing hooks and eyes, covered buttons and trimming loose threads. If you are having your gown dry cleaned through Jennifer's you need to have that done before your first fitting. The turn around time is typically 4 weeks and costs $250 on average. You must have the shoes you are going to wear for your wedding at your first fitting and any undergarments. Bra cups and strapless bras are available for purchase at Jennifer's. It is our pleasure to serve you and we look forward to sharing in this special time.